It’s not everyday that we can hop onto a train to Paris from London just for an afternoon tea, but now we can! Well, technically not hop onto a train and go to Paris, but its close to that – we can hop onto the tube and go to Covent Garden! “Whaaaaat? Covent Garden, you say?” “Yes! Covent Garden!” In the midst of London’s popular shopping and tourist site, the Parisian patisserie Laduree sits in the centre of Covent Garden Square. So I dressed up, took the tube, and arrived Covent Garden. Walking on the signature cobble-stoned street leading up to the piazza, the Covent Garden square was packed with people as usual. We walked up to the narrow, green doorway to the infamous Laduree patisserie in anticipation of an authentic Parisian experience. Given its renowned reputation, the Laduree store in Covent Garden was much smaller than what I had expected. The ground floor was a compact patisserie for takeaway and we walked up the tight, spiral staircase to the first floor for dine-ins. Luckily for us, we didn’t have to wait for a table (most likely because it was a weekday!) We were even given the option of whether we wanted to sit indoors or the bijou Parisian terrace. Having just entered the tea room from the chilly London winter, we decided to settle for indoors, (despite the seats being rather cramped and packed I must confess). Presented with so many cake and pastry options on the menu, we selected the afternoon tea set. For £23.50/person we were able to choose from an array of choices along with a tea of our choice from the menu. Distinctively different from the traditional English afternoon tea sets, the sandwiches were presented on the top-most tier of the 3-tier tea tower. I picked both my sandwich choices to be smoked salmon, pain au chocolat, sugar brioche, Ispahan and Millefeuille Praline. The smoked salmon w/ cream cheese sandwiches were succulent, despite being very simply-made, but the sincerity of the notable patisserie is shown through their fine choice of bread and high-quality salmon used in just a simple plate. My favourite though, was the Ispahan – the huge rose macaron with lychee and raspberries. The refreshing raspberries alleviate the sugary palate of the huge macaron, just thinking about it makes my mouth water! Plus its super filling! The whole Laduree experience was good overall, and its afternoon tea is not too expensive for such a posh patisserie plus being super filling! 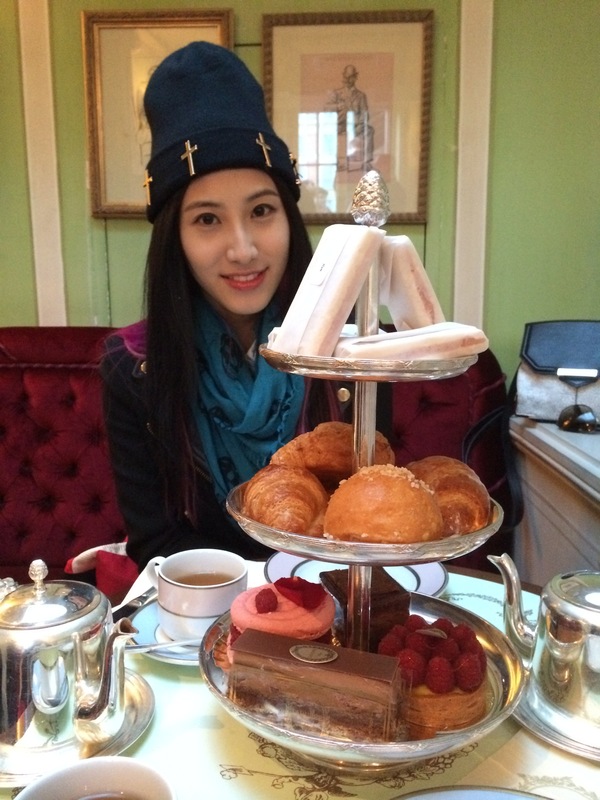 I would recommend people who haven’t been to Laduree yet, to try it out, but I probably would not return though, unless a friend would like to give it a try. Wow! Only one cake and one macaron!? Thats outrageous!! The one in London is super filling! You must go on an empty stomach, otherwise its likely you wont finish your second cake!